Just finished the Trumpeter 1/32 F6F-5 Hellcat and did not even realize I had another model in the box! That’s right a nice little bonus thrown in by Trumpeter. 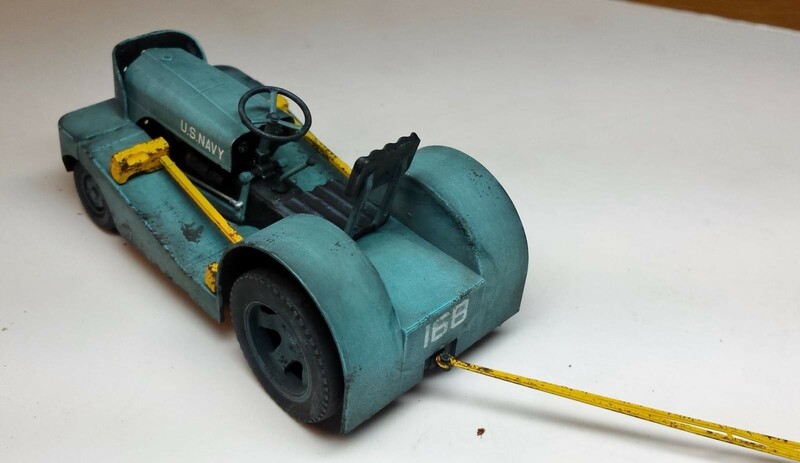 It’s a nicely detailed, US Moto-tow Tractor. 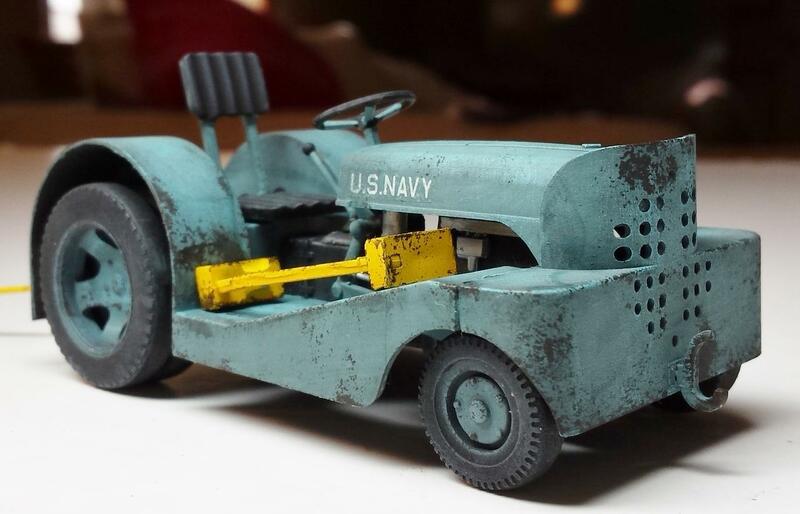 The Hellcat I just finished was such an intense build that I needed a break and this was the perfect project; build the little tow tractor and have some fun with it. I had no idea what color to paint it so I did a little research on-line for photos. I discovered that this was actually a common question for modelers because Trumpeter forgot to tell us. So some internet research supported the idea that 3 common color schemes were used. It appears they were either Navy Blue-Grey, Green/OD, and/or Yellow. I am a fan of Navy Blue-Grey and wanted it to match many of the Navy 1/32 Fighters I had made this past year so went with that idea. I was not really overly concerned about exact colors because I just wanted to have some fun. I used acrylic paints for the base and detail colors with an AK Interactive Black Primer as a black base on all parts. BTW this is the second time I used this exact primer and both times I have had severe clogging issues with my airbrush. This happen with old airbrush and my brand new Iwata HP-CS. It really did a number on my airbrush after usage and I needed to tear it down completely and clear the clogs. Regular between color cleaning did not work and I could not even properly spray the second color without this action. I will not be using this paint again. The Navy Blue/Grey was sprayed on in a mottled pattern over the black with white acrylic being lightly sprayed into panel centers and lots of black primer showing through on the edges. I then applied a very thinned second layer of Blue-Grey to blend it all in. I then dry-brushed the entire body with sky-blue acrylic. Finally I applied a grey AK Interactive enamel filter for designed for Grey Painted Armor. I washed the excess off with a brush soaked in paint thinner. The chipping was applied with a sponge using German black brown Camouflage acrylic by Vallejo. I always use this color with my armor/military vehicle builds. The details were painted using all acrylic paints. It was then sealed in an AK Interactive matte varnish. Since I painted it grey-blue it made sense to assign this particular tug to a Navy aviation squadron. Because of this I decided to use spare Navy decals/numbers from the spares box. I used some model maker artistic license for this aspect of the build. So it was a really fun little extra build. Nice touch Trumpeter; this little moto-tow will be featured in a lot of my modeling pictures. I finished this small project in a little more then one sitting. Maybe about 4 to 5 hrs working time. Sometimes you just need to keep it simple and fun. It was a really cool side project, I like your color choice. You are not alone with the clogging issue. I have just thrown away a bottle of their gray primer, for exactly the same reason. It kept clogging my airbrush, and it was really difficult to clean it properly. I have no idea why. That is such a mundane piece of equipment that it usually gets forgotten. I’ll second your kudos for Trumpeter including it in their kit! I’ll bore you with another true story, if I may. My Dad was an enlisted pilot during WWII. As such, he was a Petty Officer First Class and the chief mechanic of his own plane. 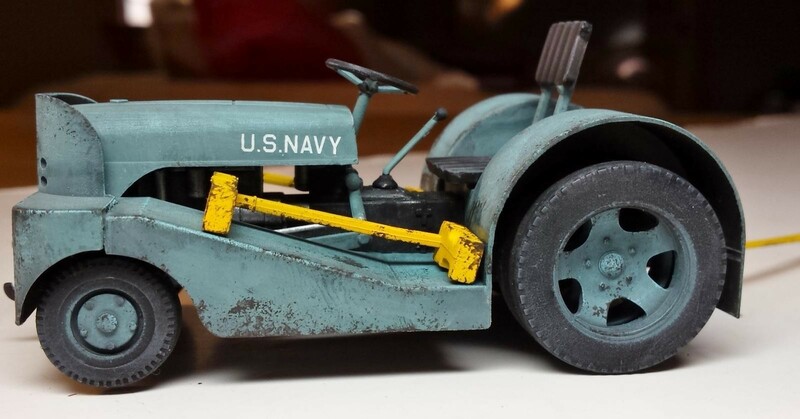 Once, on the carrier he was assigned to, he was operating one of their tow tractors – probably one just like your miniature – and he was hard at work and managed to knock one of the aircraft over the edge. Of course, this caused the loss of that aircraft AND his own personal loss of rank from PO1C to Petty Officer 3rd Class, a loss of TWO ranks! He wasn’t very proud of that particular period of his Navy career, but I doubt he’d mind me telling it here! Dad was responsible for me getting into modeling. 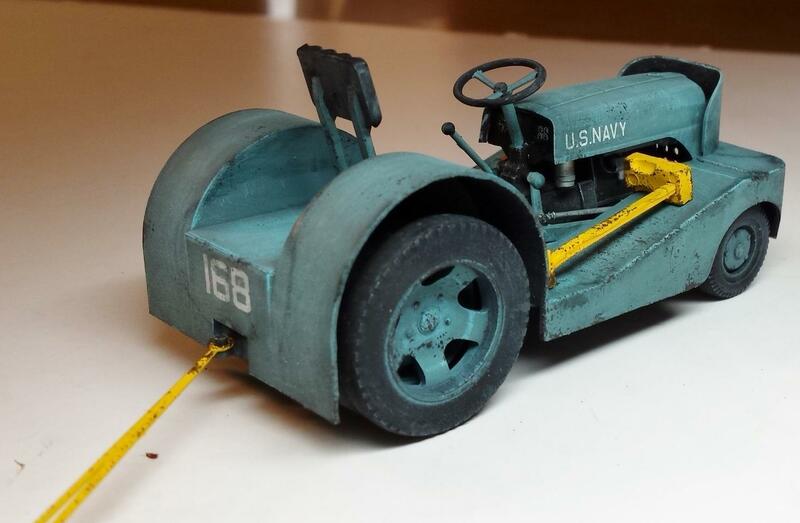 He began by building the original 1/48th scale Monogram Navy planes (F4F, F6F, SBD, TBM, SB2C & others) because he had flown all of them at one time or another, and especially the SBD, TBM, & F4F which he had flown in combat. He flew the F6F & the SB2C but never in a combat situation. “It turned out to be a ‘Milk Run’ only” was how he explained it when I asked about flying the F6F. Some kids play baseball or other sports with their Dad, or they go camping &/or hunting; I built models with mine. Anyway, GREAT job on a little, but mighty piece of historical equipment. 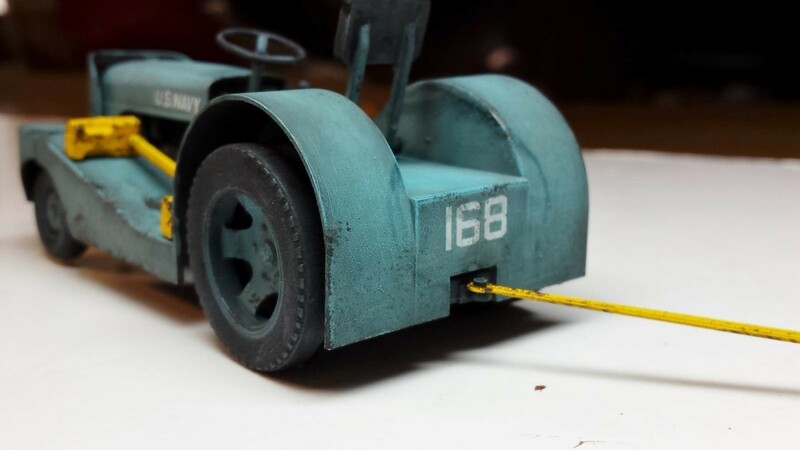 Paul, @jjetmec I’m sorry if it seems like I tried to hijack the comments about your great build, but the pictures & story of this tow tractor reminded me of my own “connection” to them. Interesting add in the box. 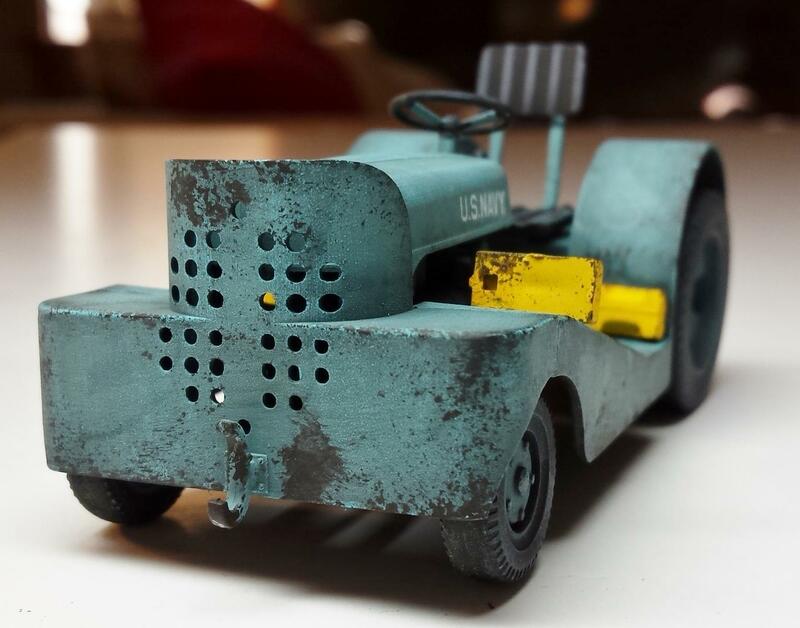 It looks like a used tractor. We modelers are quite last few years. More and more little company’s are producing tractors and other machinery, used around the apron. Like Gabor with his HUFFER. 2. https:// protocol is enforced on all pages, including your login, password entry, posts, uploads, private messages etc.